Today's guest post is from Kristin, and it examines sexism in geek culture. When a friend of mine posted a link to a blog titled Star Trek: Into Sexism soon after I’d seen the movie, I was all like, YES. It made me think of a Tumblr blog that I no longer follow because of some of its sexist posts, such as this one. They tended to be male, portrayed as being afraid of and intimidated by others; weak. It doesn’t exactly attract new members, especially women. But I guess, like all groups, it offers a certain kind of protection to those who are accepted into it. If you don’t know by now, Day is the writer, producer and star of the web series, The Guild, which ran for 6 seasons (I think the 6th was the last, but I’m not sure). She’s also the founder of YouTube channel Geek & Sundry, which hosts a number of programs of interest to geeks. Although my partner argues (not sure why it has to be an argument or even matter) that she is attractive. He doesn’t say more than that, but I guess it’s implied that she can’t just be judged on her talents or that she has to be excluded in some way because of the way she looks. 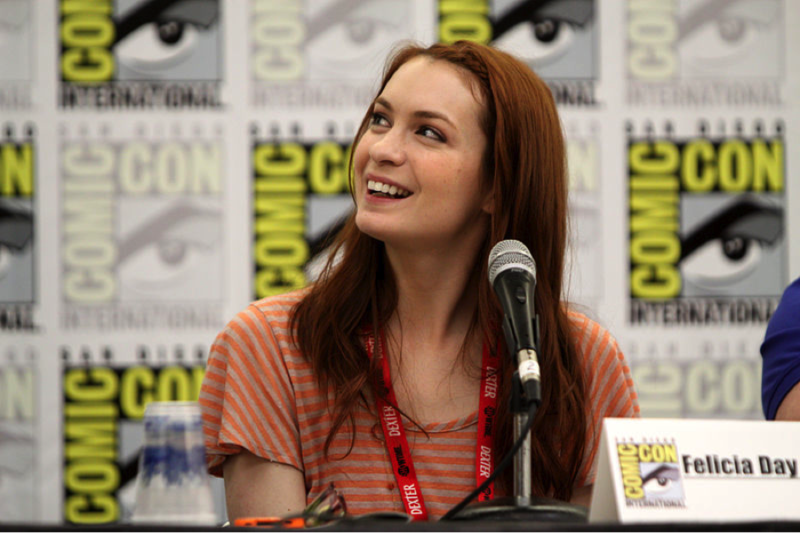 But to say such a thing is to ignore the fact that Felicia Day created The Guild herself - she wasn’t merely hired on as a face. This was her project. She’s also got stereotypical geek cred: she’s an avid player of video games and an introvert. But I’m gonna argue with myself here and wonder why you need that geek cred to be a geek in the first place. Here’s where I’ll return to Star Trek. Gene Roddenberry’s original Star Trek (1966) had the most diverse cast on television for the time. In an interview, George Takei gives the cultural/historical context for the original Star Trek and comments on Roddenberry’s mission. Star Trek was set in the 23rd century; it was Roddenberry’s idea of what such a future might look like. But it was still 1966: Uhura was the only woman with a main role and the uniform for women were mini-dresses. Fast forward to 2013 to Star Trek: Into Darkness. The women are still wearing mini-dresses and the two main female characters: Lieutenant Uhura and Dr. Carol Marcus, have minor roles. Dr. Marcus as a rebellious daughter and possible love interest for Kirk; Uhura as a love interest for Spock. Star Trek: Into Sexism cites one ridiculous scene with Marcus; I’ll cite another with Uhura. It’s the one where she, Kirk and Spock are in a shuttle on their way to Kronos, a deadly and illegal mission, and supposedly all Uhura can think about is her beef with Spock’s logicalness. I can’t find the clip on YouTube, but if you’ve seen the movie, you know what I’m talking about. I wonder what responsibility Hollywood has to continuing Roddenberry’s vision of diversity? Star Trek is set in the future, though the new movies are prequels. They seem to struggle with which details they want to keep from the original. They keep the mini-skirt dresses, but get the original Klingon foreheads wrong, which became wrinkly in Star Trek: The Motion Picture (1979). So, based on prequel rules, they should have still had smooth heads. The sexism of The Original Series was sexism of the 1960s and Star Trek Into Darkness, though a great action movie of 2013, does nothing to further Roddenberry’s vision of a more diverse, more connected universe. All this is to say that I still love geeky things like Star Trek and I’m still excited about geek culture, but it’s always disappointing to come across scenes in movies where a woman with a PhD changes her clothes in front of a man for no particular reason, or when [geek] women’s bodies are being objectified in a Star Trek/Star Wars joke on the internet. It’s the kind of thing that one might hear being discussed at this year’s Geek Girl Con, which I hope to attend. Kristin Fitzsimmons lives in Minneapolis, MN where she is a recent graduate of the MFA Creative Writing Program at the University of Minnesota and an occasional teaching artist at The Loft Literary Center.